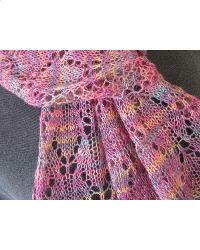 Delicate long rectangular scarf in knitted lace. The silhouette of yarn overs in the main pattern stitch reminded me of maple leaves, and thus the name. As with the other lace scarf patterns in the HeartStrings collection, there is a pretty lace border pattern that is knit at the same time as the center lace pattern. Easy to knit on just a few stitches, and enjoyable to wear in a variety of ways. Project Size: 10" by 64"